St Peter’s Seminary in Cardross, near Dumbarton, was built in 1966 as a training college for priests. It was once described as a ‘modernist masterpiece’ but closed in the 1970s and lay empty until a plan emerged to turn it into a cultural centre. However, that plan was shelved and the building is now set to remain a ruin. The seminary, which is surrounded by acres of woodland, was designed by Scottish architectural firm Gillespie, Kidd and Coia for the Archdiocese of Glasgow. 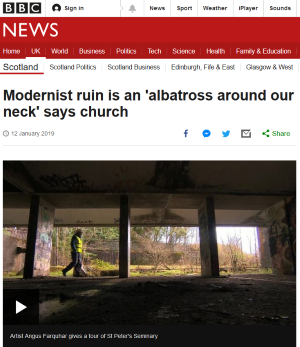 … The structure came to be considered a modernist masterpiece but its working lifetime was short and when the number of trainee priests fell, the seminary was deconsecrated. Since then, the building has became degraded by fire, rain and vandalism, but it still regularly attracts visits from architecture students and aficionados from around the world. Its importance was recognised in 1992 when the seminary was Category A listed by Historic Scotland. …The Archdiocese of Glasgow has been trying to find someone to take the building on for decades but now fears it will have to remain a ruin. Until June last year there was hope for the building, with arts organisation NVA working on turning it into an arts venue and cultural centre. It spent about £3m trying to make the building safe and removing hazardous materials such as asbestos… However, NVA closed down last year, saying the challenges facing the company were ‘compounded’ when a core funding bid to Creative Scotland was unsuccessful. … The seminary lies in the Argyll and Bute Council area. A spokeswoman for the council said St Peter’s was on greenbelt land which restricted any possibility of new development. However, she said the area around the seminary had been designated an ‘Area for Action’, which offered the possibility of opportunities for public leisure and recreational purposes.